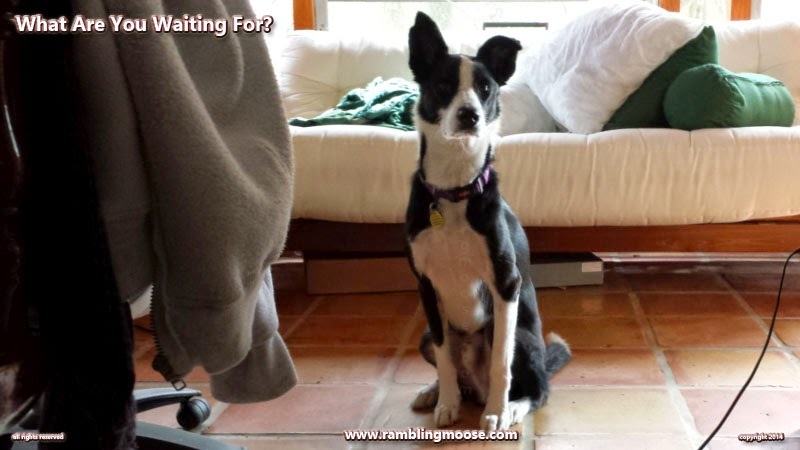 Rambling Moose: What Are You Waiting For? I've said it before: We train dogs without our even knowing it. No, I'm not going to make the usual comments about what they're watching you do, simply because they do. They live with you and since we don't expect them to tell on us like the kid sister in the tattle tale stage, we do what we will even if the dog is watching. And isn't that what training is? Watching and Remembering? Somehow I trained Rack, my McNab Dog, to sit when he wants my attention. He still is unruly around other dogs. Going into the heeler mindset of a herding dog, he will nip at their heels. Even much larger dogs, he will grasp their ankles and hold on. At least I think it is a hold on since the other dogs he does this to have not attacked him for this behavior. The other dogs he has done this to are sometimes much larger, even more than twice his size. I'm sure other McNab owners will say the same thing. But lately if I tell him he's doing something wrong, he is listening. If I can get through the puppy mindset of playplayPLAY, he will simply stop what he is doing and sit. With Lettie, my departed McNab, I could tell her "Show Me" and she would take me to what she wanted. Then she would stare at "it" and then back to me. It was obvious what she wanted. Rack isn't quite that sophisticated yet. He simply sits and stares me down. Or stares through me, I'm not so sure which is which. With his other quirks, this one is turning out to be a useful one. I was deep in the middle of mucking about with Photoshop. I had a "head shot" of Rack that I liked and I wanted to erase all the background rendering it something I could paste into any other picture. Select area with the magic eraser tool, then hit delete, repeat as needed. I was happily trimming Rack's whiskers from the flowers in the background when I felt laser beamed intensity in the room. Stopping what I was doing, I looked back into the Florida Room. That was when I saw the source of those beams. My boy was trying for my attention. Successfully. I set the computer on the table, stood up, and said to Rack "Show Me" hoping to strengthen that behavior. He immediately walked to the back door. We went outside for a good 15 minutes of laps around the pool, quick switchback running around the palm, disappearing through the wormhole that is behind the shed, and coming back into the yard. I swear there's a Tardis back there, since he disappears into that area and goes to visit an alternate universe, file his reports with Orson like Mork From Ork, then comes back fully dog through my night blooming jasmine back in that corner of the yard. After all, it's larger on the inside since he takes much longer than I expect to come back into our own reality. In a while he tires of this and tries to drink from the pool. If he's paying attention I tell him to go inside and he'll walk to the door. If I am not paying attention, I will see him staring at me from across the pool in exactly that same pose, one ear up, the other cocked over at the top, waiting for the dumb human to wake up and stop staring at the Monarch Butterfly caterpillars eating away his milkweeds. It would be at that time that I realize no matter how much he hides from noises blocks away on Wilton Drive, he is learning and it didn't take any effort. Like the breeders say about the McNab Dog, "if you can't train a McNab, you don't need a dog". In his case he's training his human well. He can get me to stand up and walk outside, can't he? On the way back, I'll get the laundry off the futon. It looks a little shabby sitting back there but that's between you and me even if the futon is the albatross around the neck of all furniture. Have you ever tried to give away a futon? I didn't think so.